Loving and Emotional, Shrewd and cautious.Sensitive and nurturing. Intuitive as well as imaginative. Sympathetic and Protective. Indecisive and moody. Over-emotional and sensitive Clinging and possessive. Extremely intuitive and imaginative, these people make great artists and designers. You will find them wherever there is a need for creativity and flare. Never underestimate the scope of their imagination either. Freedom loving, courageous and pioneering, loves adventure, is self assertive, and has as abundance of energy. Can be enterprising and will work from sun up to sun down, the Cancerian will run not walk. He/she is generally forceful by nature and very direct. Cancer people are very protective and sympathetic to those around them. They are very capable of “feeling your pain” whether it be physical, financial or emotional. They will help out to, as long as it is clear they are not being taken advantage of. When they are shining Cancer is sensitive and caring, kind and sympathetic, they have an urge to care for and nurture people. This trait expresses itself particularly well with things concerning the family and home life. This can be considered the “softer” side of the Cancer personality. However lurking in the shadows is the hard side, which can be self-centered an enterprising. The Cancerian person tends to be kind and caring individuals with a natural sense to nurture and care for others, especially their loved ones. They are very protective and can be quite defensive at times. They may be emotional and sentimental often seeming to be extremely touchy. Often seen as having a keen sense of perception and observation and the ability to construct things in their imagination. Cancerians are meditative and have keen abilities to concentrate. They are creative and have a natural tendency to study and analyze things. Cancerians make some of the best students and can learn most anything that they set their minds to. The cancer zodiac sign can be extremely protective of a vulnerable underside. The hard shell appearance is outwardly tough and impenetrable, but deep inside cancer is highly caring and sensitive, even if they manage to hide it well from the rest of the world. Cancer sun-sign is very imaginative. When they are tuned in to their own natural rhythms, Cancerians are imaginative, intuitive and resourceful, often realizing when it’s good to reach out to others and when to back off, withdrawing into their inner self. 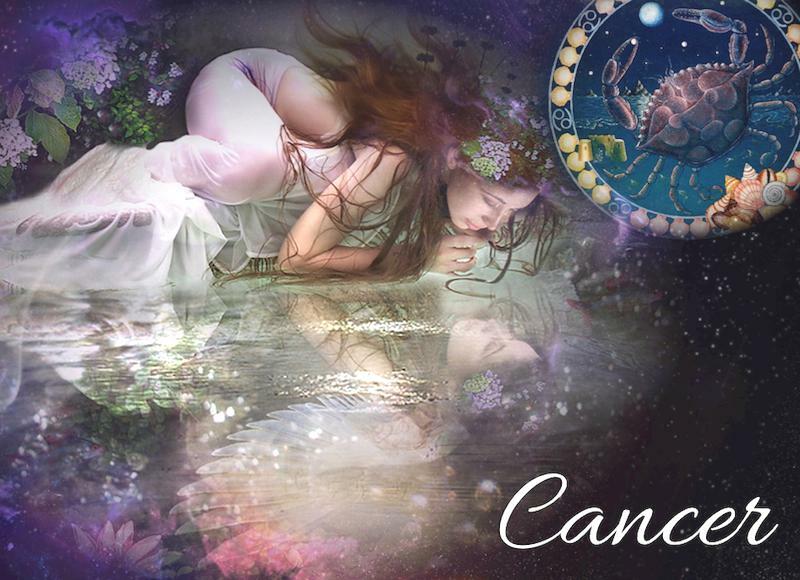 When in sync with their life, Cancerians are resourceful, imaginative and have natural intuition. They seem to know when and how to reach out to others in need and also when to withdraw within themselves. At the same time they have the dilemma of being ambitious and forceful while being sensitive and nurturing. This makes it practically impossible to understand the Cancerians contradictive nature and certainly how to deal with one. Cancerians sometimes experience trouble deciding between the ambitious, tough and outgoing side of their nature and the somewhat sensitive, inward looking part of themselves. This can cause inner conflict and mood swings, making it almost impossible for others to assess how they will react to a given situation. Cancer has a complex inferiority problem sometimes, so that any hurt, imagined or real, is magnified. cancer sometimes shows a tendency to look back at, and hold on to, things in the past. This is a sign of their inner possessiveness. It also highlights a natural conservative aspect of them. As a cardinal sign, they will often be the initiators of change. real or imagined, it is pondered upon. They may tend to hold on to the past, having an exceedingly hard time with letting go. Consequently, they will often initiate the changes if any are to come. This zodiac sign having the tough outer shell of the crab also has it’s soft belly. Even though they may seem cool and in control on the surface, they quite often are prone to emotional disruptions. While desiring the feeling of security, uncertainty in life may cause the agitation, which in turn makes them susceptible to gastric problems. Heartburn, gastric disorders and obesity are of major concern to the Cancerian. Although they are supportive of others close to them, they usually suffer in silence as they are not ones who communicate freely. Water retention is also common among Cancerians. They should avoid high fat foods and learn to talk openly about things that bother them as to avoid any chances of stomach ulcers. Watch food intake as Canerians are often the greatest of worriers, which may in turn lead to overeating and an expanding waistline. Cancer is the forth zodiac sign. Cancer represents the crab sent by the goddess Hera. According to Greek Mythology it gives lasting fame to the crab as it was sent to combat Hercules, Hera’s old enemy. As Hercules himself was embattled in his second series of the “Twelve Labors” with the destruction of the nine headed serpent “Hydra”. During the battle the crab was said to have nipped at Hercules’ ankles but was in turn crushed under foot. As the crabs reward Hera is said to have raised it to the heavens.